It’s the time of year when our readers start to send us their thoughts about the coming election. Most years, we nearly receive more letters than we can publish. That’s a good thing, and a reason to be grateful to our readers. • Candidate endorsements will be letters, not “Valley Voices” columns. • Endorsement letters are limited to a maximum of 500 words. Shorter letters are better. • Readers can submit one endorsement letter per election season. That includes primaries. If you endorsed a candidate during the June primary season, you can’t submit for that same candidate for the general election. • Endorsement letters must come from people in our readership area. We receive plenty of letters from readers in our neighborhood. During June’s primary season, this newspaper received a deluge of candidate support from outside our readership area. That’s understandable, since the Eagle River Valley is in parts of two large congressional districts, and our State Senate district covers the state from Vail to Lake City. Still, if you want to endorse a candidate, please tell the readers of your hometown newspaper. There are plenty of like-minded Republicans and Democrats right here, and they do a great job. This is a local newspaper, dedicated to being a forum for local voices on issues. 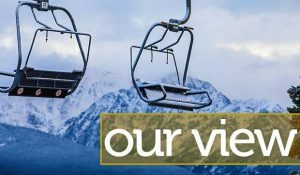 If you own a home in the Vail Valley and make your full-time residence elsewhere, your views are welcome. If Vail is just a dot on a district map, please keep your advocacy work closer to home. • Candidates who want to write about their election platforms will be limited to one “Valley Voices” column of between 650 and 700 words. On the subject of letter and column length, if you go over these limits, you’ll be asked to cut your submissions. • The cutoff date for all election-related submissions is Wednesday, Oct. 31. Anything received after that date won’t be published, mainly because the “to run” pile will probably be pretty deep by then. Questions? Email Vail Daily editor Krista Driscoll at kdriscoll@vaildaily.com. Thanks for your understanding.